These nine rites have been handed down through the millennia, initiating and supporting the seeker's journey towards integration and becoming. As scheduled above, the nine rites are divided into three separate days in order to allow time to integrate and strengthen each into our daily life. This first rite consists of protections installed in your energy field. These are also known as the Bands of Protection, and entail five energetic bands representing earth, air, fire, water, and pure light. These bands are installed in your luminous energy field and act as filters. They break down negative energies that come your way into one of the five elements so that these energies can feed you instead of making you toxic or ill. The Bands of Power are always ‘on’. In a world which holds confusion and fear, the bands provide essential protection. 'The Healer Rites' are transmitted in order to activate healing and balance within and without. This activation connects you to the energy of a lineage of healers that support and assist you in your personal healing. It is said that during these great and challenging times, we have tremendous spiritual assistance available to us to heal the wounds of the past and of our ancestors. The Harmony Rite You receive seven archetypes into your chakras. In the first chakra, you receive the archetype of serpent; jaguar goes into the second; hummingbird into the third; and eagle into the fourth. Then, three luminous beings extend support into your upper three chakras. Huascar Inca, the keeper of the lower world and the unconscious is transmitted into the fifth chakra; Quetzalcoatl, the feathered serpent God of the Americas, and keeper of the middle world (our waking world) goes into the sixth; and Pachacuti, the protector of the upper world (our super-conscious) and keeper of the time to come goes into the seventh chakra. The Seers Rites Receive the fourth rite, the Seers Rites Through these rites, filaments of light are installed extending from your visual cortex (in the back of your head) to your third eye and heart chakras. This activation awakens your ability to perceive the invisible world and energies around you. These rites transmit energetic 'lightning and fire' to allow us to work with the head and the heart in unison. The Day Keeper's Rite is about receiving the power of the plains. In other words, the power to support the health of the community, assuring that everyone gets along. The Day Keepers where usually the mid-wives who attended to births and deaths, as well as being herbalists, or curanderas. Generally, they were women, knowledgeable about the ways of the feminine earth. This initiation begins the process of healing your inner feminine, and helps you to step beyond fear, beyond death and practice peace. You connect to a lineage of master healers from the high mountains. This rite helps you to begin to heal your inner masculine, step outside of time, and become steeped in the teachings of infinity. You connect to stewardship of all life on Earth. This rite helps you learn the ways of the seer and dream the world into being. The 8thactivation Rite These are the ‘transition’ rites. This is the portal of our becoming. They mark the age of meeting ourselves again. This rite anchors you safely to the time after the great change that began around the year 2012. The aging process is slowed down, and you become resistant to diseases you were once vulnerable to. When you receive these rites, you acquire stewardship of the time to come and all future generations. Taitanchis is another name for Spirit. When you receive this initiation, you awaken the God-light within you. It is the coming together of the spirit of the male and female energies to create the resplendent ONE; he/she who shines with the light of the Sun. This is the ‘homo-luminous club! 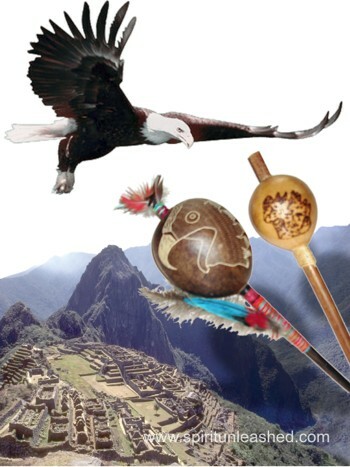 The Creator rite was brought forth and gifted to us by Inca elders in the Andes during the summer of 2006. This profound and transformative event is open to everyone! It is time. It is time to realign with your spiritual and greater Self. It is time to recreate yourself and source a new vision of what your world can be. Don’t wait. The ancient healers and shamans from the High Andes of Peru have gifted us with a set of energetic initiations which are doors for us to walk through. These initiations occur at the energetic and spiritual levels of our being, imprinting within us nine keys to access our true potential. In addition to receiving the Rites, these one-day events will introduce you to the Q’ero tradition of shamanic healing, will offer you a profound understanding of each Rite which you are receiving, and will instruct you in how to maintain the inner connection each Rite is offering you as you are pulled by the distractions of the everyday world. Each of these three events will support your journey of being at home and at peace with who you are and who you are becoming. Guided journeys and yogic practices, including instruction in meditation and techniques to support your unfolding will also be offered at each event. There will be ample time for Q & A, and establishing your mentoring along the spiritual path. Susana Sorí has been granted the power and authority of the Q’ero lineage to offer and administer these nine rites in their original Quechua language. 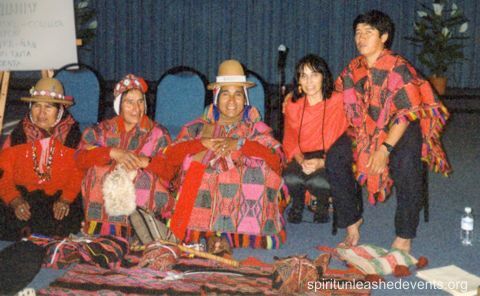 From left to right: Dona Bernadina Apassa, Don Humberto Soncco Quispe, High Priest of the Q’eros at that time, mentoring Don Francisco, presently in that position, Susana Sorí, and Don Porfirio Sequeiros, the Q’ero’s Quechua-to-Spanish translator. Susana Sorí has been granted the power and authority to offer and administer these nine rites. Copyright © 2014, 2019 by Susana Sori. All rights reserved.